Twill weave is a kind of weave that repeat on three or more ends and picks and produces diagonal line on the face of fabric.In a regular twill the diagonal line or twill line produces at 45 degree angle with the horizontal. Twill weave is second basic weave from the production and using point it view, it is also in second position .Mainly the fabric painting are made it the structure. Example ,Denim fabric (3/1) made it twill weave. Diagonal line can be seen on the faced of the fabric. 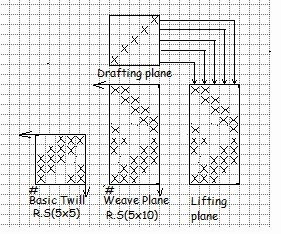 Twill line may be from lower lift to upper right(Z-twill) or from lower right to upper lift(S-twill) corner. Smaller repeat twill is(3)It means take at least end and three picks produce twill weave. Generally straight draft is used for twill weave besides this pointed or v draft is also used. Appearance it will design can be seen from both rides the fabric. Diagonal lines run at angle vary between(15-75)Degree but in a continuous or regular twill is 45 degree. 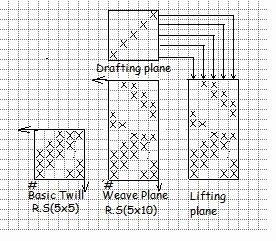 Twill angle is the angle which is produced by twill line with respect to the horizontal line.This twill angle depends on following factors. Ratio between EPI and PPI. 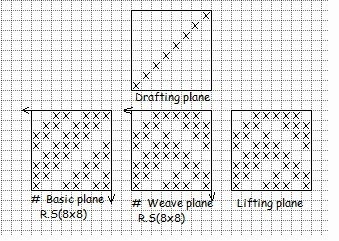 Difference between warp and weft count. Rate of advancement it interlacement warp and weft. 1. According to direction of twill line on the faced of fabric. 2. According this aspect there are two type of twill weave namely. S -twill:Down word displacement of twill line from upper left to lower right corner. Z- twill:Upword displacement of twill line from lower left to upper right corner. Warp faced twill:For example twill. 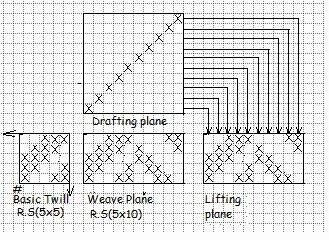 Weft faced twill:For example twill. 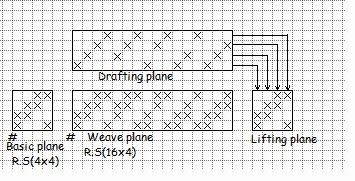 Sample warp or weft twill: It every warp thread passes under only one weft called simple warp twill.For example , twill are simple are warp twill again it every weft thread passes over only one warp thread in twill weave,that is called simple weft twill.For example,, twill are simple weft twill. Multiple twill:If in a fabric there are more than one twill line in the repeat,it is called multiple twill. The twill of short floats less prominent twill line. The twill line of long float more prominent. Twill off course and soft twisted yarn→ More prominent twill line. Twill of fine and more twisted yarn→ Less prominent twill line. 3. Thread per inch(TPI): More number of ends or picks per inch causes more prominent twill line. When direction of twill on fabric is opposite to the direction of twist in yarn the twill line becomes more prominent and vice-versa. A point is sellected(usually the last warp is sellected) as the reversing point and so it is sometime call as point twill.In this twill pointed or straight draft is used. 1. 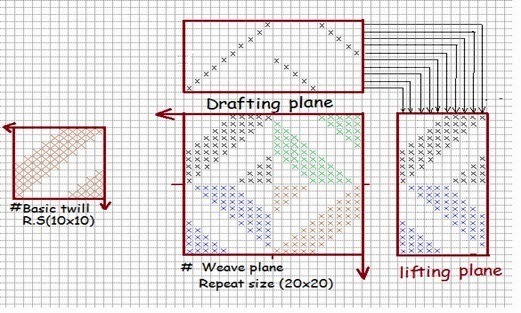 Horizontal zigzag twill: When the reversal direction of twill line occur upon the warp yarn,it result a horizontal zigzag twill,Here the basic twill is extended in warp direction.Here the number of warp yarn in a repeat is double of the number of weft.In horizontal zigzag twill pointed draft is used. 2. 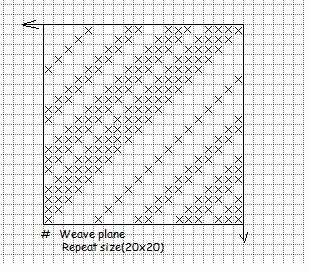 Vertical zigzag twill: When the reversal direction of twill line occur upon the weft yarn,it result a vertical zigzag twill,Here the basic twill is extended in weft direction.Here the number of weft yarn in a repeat is double of the number of warp.In Vertical zigzag twill straight draft is used. Here reversal direction occurs after a middle line.Here at first the basic twill is drown then the number of central point is selected in zigzag twill.Rather in exdended second half of basic twill the following matter happened. The floating point of first half become down in second half. The down of first half become floating in second half. It is a derivatives of twill weave.It constructed on the bans of zigzag twill principle.It is obtain by combining a horizontal and vertical zigzag twill.So here in the repeat the number of both warp and weft thread are double then that in basic twill. 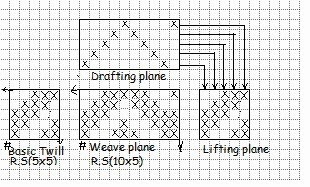 Dimond design geometrical about there vertical and horizontal axis.In this weave pointed draft is obtained. 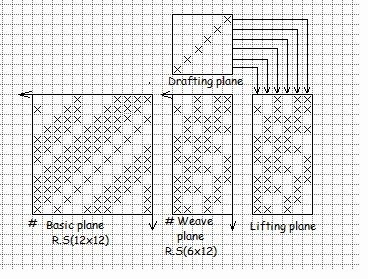 To contract a diamond design at first the design repeat is selected.It the basic twill is 3 up 3 down,that is 6×6 insize,the repeat of design will be 12×12 insize. Uses: Towel, Bed cover, Table cloth, Pillow cover etc. This derivative of twill weave is created on the basis herring bone principle. This design is constructed by combining horizontal and vertical hearing bone twill. Broken twill can be of way and ioncrease of broken twill straight and Broken draft is used. The relative ratio of ends and pick per unit length. The rate of advancement of one interlacing with respect to the following one. Normally the twill angle is 45 degree where the end and pick per unit area are equal.But in elongated twill,the twill angle more or less than 45 degree any twill design without twill angle. (a)With the help of step number. (b)By sellecting stasting of elongated twill with a base line. If the step number of elongated twill is two, then by taking only odd numer of warp thread from the basic twill here the warp number in step twill will be equal to the basic twill. Here at first a step number is to be selected. In such a way that the repeat of base line become divisable by that step number. 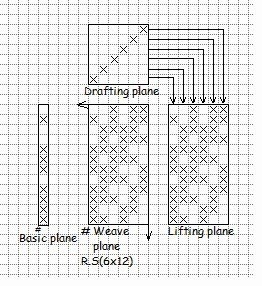 For example,for a twill with formulla number the repeat size will be 14×14.If we sellect move number as 2 then in produced elongated twill the number number of warp thread will be 7 and that of weft thread will be 7 in case of weft faced twill. Warp way steppet twill:Here stepping is done in warp way. Weft way steppet twill:Here stepping is done in weft way. By shaded twill we can create shade effect on fabric the shade effect is created by the combination some thick to thin twills or thin to thick twills. Twill weave are extensively used in manufacturing cloth for garments household cloth and industrial cloth. Generally dimond,diaper and zigzag twill are used for making pillow,cover,screen,unpholstery,bed sheet,towel etc. Continious twill are used for making fabric for shirting,suiting and pantin(denim,gaverdine). For making various type of ornamental cloth,other derivatives of twill weave are used. Hearing bone twill are used in the cloth of suiting and overcoats.